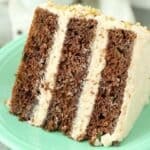 This triple layer Chocolate Zucchini Cake features a delicate chocolate cake stuffed with zucchini. It’s frosted with a rich brown butter frosting. My parents always grew zucchini in the summers, and at times we had zucchinis that were as big as our arms. We would always shred the zucchini and freeze it so that we had plenty on hand when the zucchini bread cravings hit. My dad always keeps a few loaves frozen to enjoy throughout the year and he likes to experiment with different flour combinations and using maple syrup and chocolate chips to change the flavor. Last summer, when I made my chocolate zucchini bread ice cream, I told him he had to try it out since he loves ice cream so much. This weekend, I am going to San Diego to see my dad who is coming out west to visit us. Maybe he’ll see this and bring me a loaf of his homemade bread! Ever since I made the chocolate zucchini bread for that ice cream recipe, I couldn’t stop thinking about making it into a layer cake. I debated back and forth on the frosting. As much as I was tempted to make a chocolate frosting, I finally decided that a brown butter frosting was a better fit for this cake. Ladies and gentlemen, I give you Chocolate Zucchini Cake with Brown Butter Frosting. 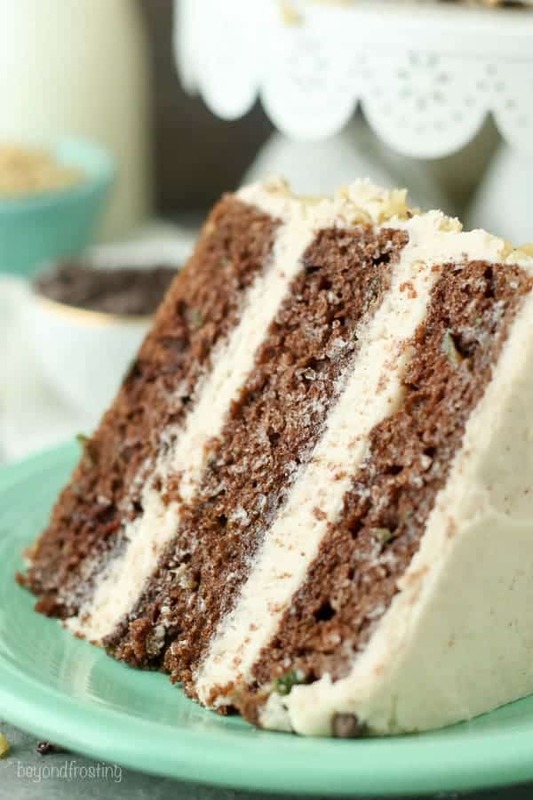 This triple layer cake features a delicate chocolate cake stuffed with zucchini. The rich buttercream frosting is flavored with brown butter, which is one of those ingredients that just makes everything better. 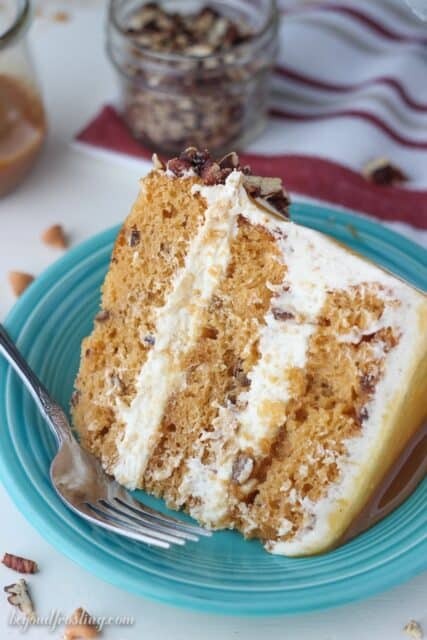 This recipe is similar to my Chocolate Sweet Potato Layer Cake, but instead of sweet potato I used zucchini. The cake itself is somewhat dense and chocolatey cake but with a light crumb. The batter comes together relatively easy since it uses vegetable oil instead of butter. That means there is no waiting for the butter to soften and then having to cream them together for several minutes before adding the dry ingredients. To shred the zucchini I usually cut it into smaller chunks and then use my food processor to blend it into even finer pieces, kind of like a shredded carrot. However, due to the high water content, this can easily turn to mush, so it’s best to only do a handful at a time. You don’t want a zucchini puree. Once the cake is baked and cooled, it’s time to think about the frosting! Oh yes, brown butter frosting, that is. This frosting uses a combination of browned and non-browned butter. The frosting is still made in the traditional way, by creaming together butter and powdered sugar, but there is an additional step of browning one stick of butter first. This does take a little patience because you need to wait for the brown the butter to cool. However, you can take all the butter out of the fridge at the same time, brown one stick of butter and by the time it’s cooled, your other non-browned butter will be softened as well. I added the brown butter towards the end so that I could focus on whipping the butter and powdered sugar as needed in the beginning. The brown butter is usually liquefied so it make more sense to add it towards the end. If you need to prep this ahead of time, it’s okay if the brown butter turns back to a soft solid. However, if it hardens back to the original state, then it should be added in the beginning with the rest of the butter. Am I confusing you yet? Just read through the instructions and you’ll be good to go! 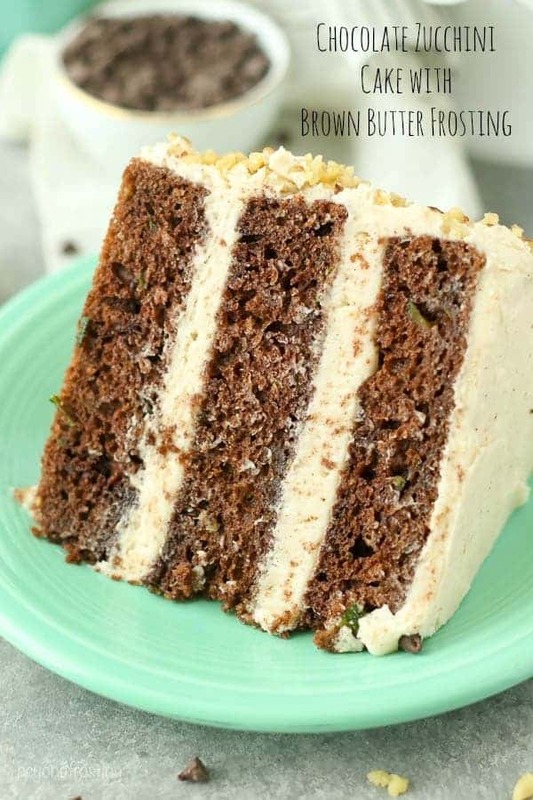 This triple layer Chocolate Zucchini Cake features a delicate chocolate cake stuff with zucchini. It’s frosted with a rich brown butter buttercream frosting. For the cake: Preheat the oven to 350° F. Grease three 8-inch pans. Chop the zucchini into one inch thick pieces and throw into a food processor. Pulse the zucchini into tiny pieces and set aside. In a medium-sized mixing bowl, combine the vegetable oil, eggs, egg whites, vanilla extract and granulated sugar. Whisk together until well combined, and mixture turns lighter in color. Add the sour cream and mix until combined. Slowly add the cocoa powder and beat into the batter. In a separate small bowl, combine the flour, cinnamon, salt, baking soda and baking powder and whisk together. Slowly add the dry ingredients and mix slowly with a spatula until about half of the flour is incorporated. Add the zucchini pieces and mix only until the flour is blended, being careful not to over mix. Pour the batter into the three 8-inch pans, dividing evenly, and bake at 350°F for 18 to 22 minutes. To see if the cake is done, stick a toothpick into the cake and if the toothpick comes out clean, the cake is done. Cool completely. For the frosting: Remove 4 sticks of butter of the refrigerator, one stick will be browned and the other 3 will be left to soften. To brown the butter, use a small saucepan, and cut the butter into pieces. Melt the butter over medium heat and allow it to boil and bubble. Once it’s starts boiling, stir it frequently and it will slowly start to turn an amber color and releases a nutty aroma. Remove the butter from the heat and allow it to cool completely. Cut the remaining butter into pieces. Using the paddle attachment of your stand mixer, whip the butter for 3-4 minutes, scraping down the bowl occasionally. Beat until the butter looks light in color. Add 4 cups powdered sugar, one cup at a time and mix on low speed until incorporated into the butter. The frosting will be thick. Add 1 tablespoon of heavy whipping cream and continuing beating. Next , add 2 cups of powdered sugar and slowly pour the cooled brown butter into the frosting and beat it into the butter until the frosting is completely smooth. Add the last 1-2 cups of powdered sugar followed by 1 tablespoon of heavy cream and a pinch of salt and beat on low speed until the cream is incorporated. Then beat it at a high speed for 1 minute to whip some additional air into the frosting. To build the cake: Even out the top of the cake by cutting off the dome using a serrated knife. Place a dollop of frosting on the bottom of the cake plate and place the bottom layer of cake on top. The frosting will help prevent the cake from sliding. In order to create even layers, I use a large piping bag fitted with an open round tip, or simply cut off the end of the piping bag. I also highly suggest to use a lazy Suzan to rotate the cake as you work. Fill the first layer of frosting by using your piping bag and pipe from the outside edge into the center. Gently spread the frosting with an offset spatula to fill in the gaps. Place the next layer of cake on top and repeat the above instructions to fill the second layer of frosting. 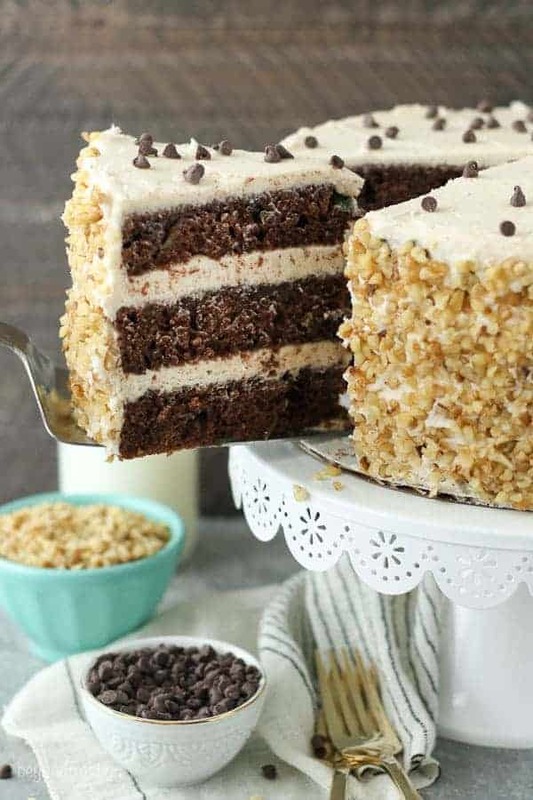 Proceed to add your crumb coat by adding a cup of frosting to the top of the cake and gently spread out to the edges and down the sides. Use the leftover frosting in your piping bags to fill in the cracks between the layers. Using an offset spatula or icing smoother, wipe away the excess frosting, leaving just enough to coat the outside of the cake. Do not mix your crumb coating frosting back into your icing if it has cake debris in it. 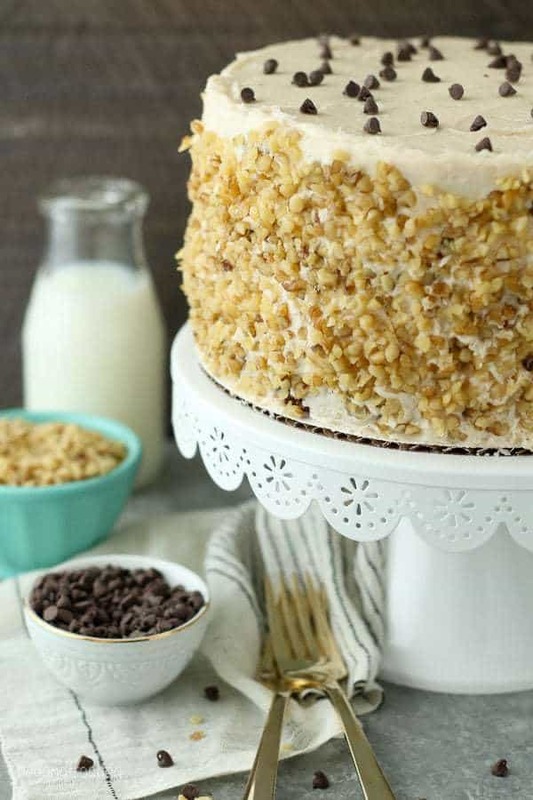 Refrigerate the cake for 15-20 minutes to allow the crumb coat to harden. 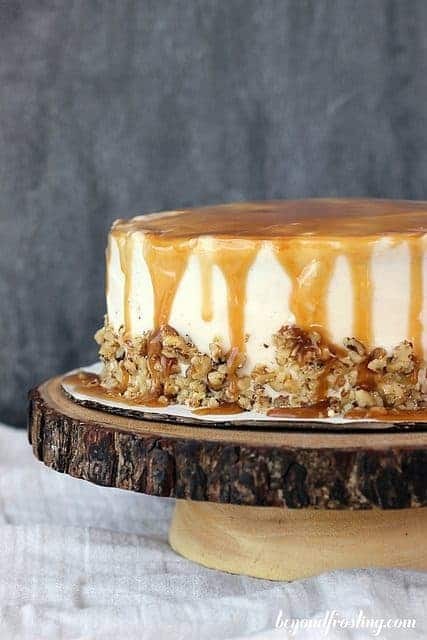 Take the chopped walnuts and press into the sides of the cake. Sprinkle the top with mini chocolate chips or additional walnuts.